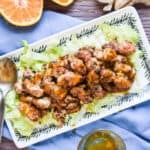 Low Carb Orange Chicken | Keto, Low Carb! Asian recipes are a staple in our household. For a while, we were making a few basics, including our Cauliflower Fried Rice, until we discovered this Low Carb Orange Chicken! The meat is hearty and tender, while the sauce is sweet and tart - the perfect complements. 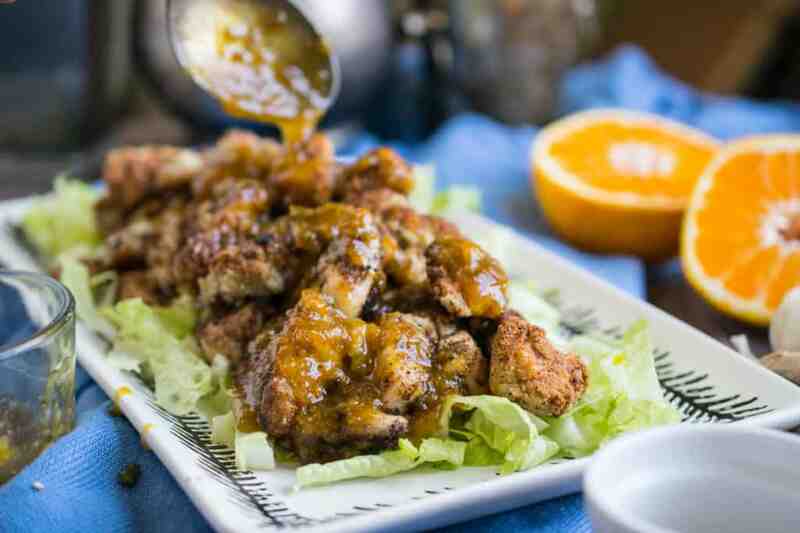 If you are a sucker for anything Asian and orange like us, then you are going to love this recipe. It may require a little extra work on your end, but it's worth all the effort and then some! One Of Our Favorite Low-Carb Meals! Why is this one of our favorite meals, you might ask? Well, let me ask you this. Do the pictures look low-carb? Do they look like a healthy alternative to take-out? You probably said no because it's the real deal! When something tastes so good, but is made from whole foods and you know exactly what went into it, it's hard for it not to be one of your favorite low-carb meals. This will become a family favorite and a weekly staple in your household, guaranteed! Chinese food was always the food that made me feel most guilty. Mostly because it was impossible to control myself around. There is something irresistible about salty, savory, meaty, fatty noodles and rice. I know you know the feeling. 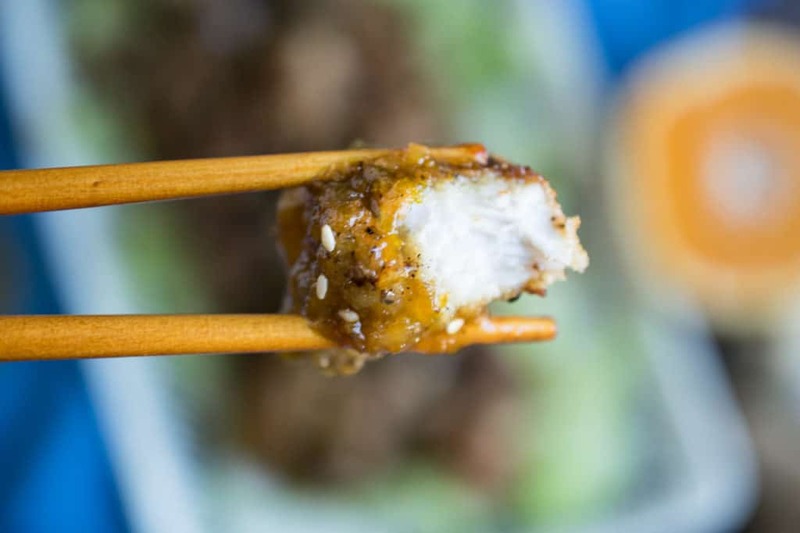 I enjoy indulging too much to cut myself off from Chinese food, so I created some of the best low-carb Chinese recipes that I could enjoy guilt-free. You should give our easy cashew chicken, lemon chicken and egg roll in a bowl a try and make them a part of your next take-out night! When Chinese is on the dinner menu you can find me lingering. The best part about eating low-carb is there is a substitute for everything, or at least it is our job to make you believe so. You can serve this savory dish up with some cauliflower rice, greens or just eat it on it's own. It will satisfy you no matter how you serve it and will even make for some great leftovers! 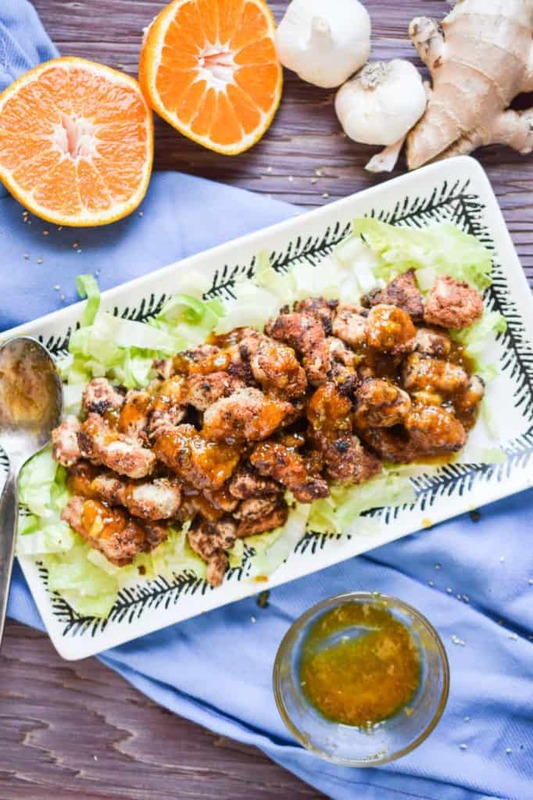 Whether or not you're a Chinese food lover, this low-carb orange chicken is a must try! *Nutrition includes MCT Oil Powder for breading. 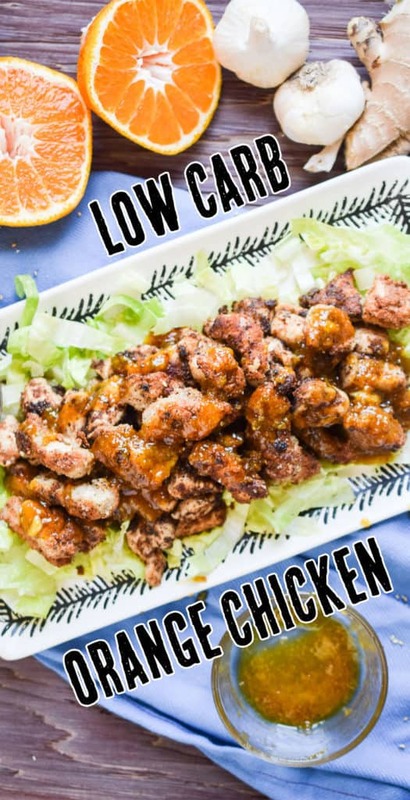 Recipe can be quickly added to MyFitnessPal - Search "KetoConnect - Low Carb Orange Chicken"
Fry Chicken: Combine the pork rinds, coconut flour, and black pepper (and optionally mct oil powder) in a blender or food processor and pulse until it has made a fine powder. Shake this mix out into a medium bowl. Pat your chicken breasts dry and then cut them into small cubes about ½ inch pieces. Sprinkle with salt and set aside. Add oil for frying into the large skillet, about 2 tablespoons. Toss a handful of chicken cubes in the pork rind mix, shake off excess and add then into the skillet. Make sure the pieces aren’t crowding the skillet, you will have to cook them in batches. Cook for 2-3 minutes or until browned then use tongs to turn them over and cook another 3 minutes, until amber brown. Remove from the skillet and place on a paper towel lined plate. Add in the next batch of chicken and repeat until all of the chicken is done. Make the sauce: Heat a small sauce pot over medium high heat. Add coconut oil and erythritol to the small sauce pot and stir to combine. Using a zester, zest the whole orange (should yield about 1 tablespoon), and the garlic cloves and ginger into a small bowl and set aside. Cut the orange in half. Once the sweetener has dissolved, lower the heat to medium and add in the orange zest mix, then squeeze half the orange juice into the sauce pot as well. Stir well and let it come to a simmer, let it simmer while you finish cooking the chicken. Stir it occasionally. Once it is thick and glaze-like remove it from the heat. Transfer the chicken to a serving platter or bowl. Pour the orange glaze all over it, sprinkle with sesame seeds, if desired and enjoy! This is great over greens or cauliflower rice!